Those of us who have embraced permaculture apply the ethics: Earth Care, People Care, Fair Share, into our everyday lives. When permaculture people engage in business, do the ethics still apply? How can we know that people we support in business share our values? As consumers we can choose products that are labeled ‘Fair Trade’, ‘Certified Organic’ and the like. A fantastic step forward from ‘conventional’ production methods where products are often made as cheaply as possible, with little concern for the consequences. When we buy locally there are checks and balances that don’t require certification, you can find out how things were made by asking the person who made them, like when you buy direct from the grower at the farmer’s market. ‘Word of mouth’ is the most powerful communication medium that can make or break a local business. It’s in a businesses interest to make sure that the customer is happy – apply self-regulation and accept feedback. Of course, the only way to be certain, is to make or grow things yourself. Then you will know exactly what’s gone into producing it. You can also avoid the hidden costs involved in manufacturing, transporting, marketing, packaging and waste processing. Making your own is enriching, empowering, rewarding and good for you – the essence of permaculture. While ideal, making your own or doing it yourself isn’t always possible or efficient. There are permaculture people out there who specialise in making or doing things that embrace our values. When you’ve got an understanding of what’s involved in doing something yourself ethically, then you’ll probably be more willing to part with a bit of extra cash to purchase it, knowing that is good value. Many permaculture business people can confidently say that they care for the earth and care for people, but fair share can be more challenging. How do we ‘redistribute surplus’ in the world of business? One idea that I’ve been embracing in my small business is tithing. Tithe comes from the old English word for tenth, where one tenth part of something was paid as a contribution to an organisation or government. It has been a common example of ‘Fair Share’ used throughout history, embraced by many religions in one form or another, often by giving to the needy. Concept: The idea of the project is to bring permaculture to a wider audience, educating by osmosis – with a useful tool that people see every day. The proceeds of sales are used to further promote permaculture. Content: Images have been sourced from a diversity of people and places that demonstrate the twelve permaculture principles in action. Artwork: The artwork is produced from Abdallah House, our owner-built passive solar house that demonstrates permaculture, using renewable electricity. Production: Made from 100% post-consumer recycled locally made paper which is certified carbon neutral and supports the restoration of landfill sites around Australia. Manufactured and printed using 100% renewables, with printing plates and paper waste recycled. Inks are vegetable based so don’t release unnecessary Volatile Organic Compounds (VOC’s) into the atmosphere or require harmful solvents for clean up. Marketing: Mainly direct to wholesale customers who have previously purchased the calendar. Online and printed reviews help raise awareness of the product, while some magazine advertising was arranged by bartering. 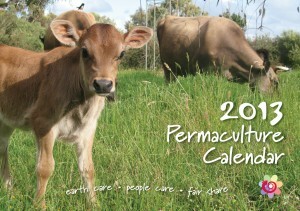 The calendar is sold directly to the public through the Permaculture Principles website. Distribution: The paper weight and size of the calendar were calculated to take advantage of standardised postage and reduced freight. The calendar was printed less than 100km from where it is being distributed. Sales from the website are posted directly from the initial drop off point to the customer. While the ethical production of the calendar goes a long way in limiting the impact on the earth and the the people who have been involved in it’s manufacture, the ethic of ‘Fair Share’ is demonstrated by tithing 10% of the net return from sales to Permafund. The Permaculture Calendar not only celebrates permaculture projects around the world, but draws from them to provide content. Just as we need to feed the soil in order to grow productive plants, we need to support our wider permaculture community by ‘giving back’ to those on the journey. By tithing to Permafund I’m confident that my contribution will be directed to worthwhile causes that embrace permaculture, that may well be featured in a future calendar. Like in nature, everything is connected, and the returns come back in surprising ways. The Permafund Committee, a sub group of Permaculture Australia, guides the distribution of funds to community-based projects and ensures that applicants comply with the objectives – in building resilience and promoting permaculture to organisations around the world. Recipients are expected to report on their project outcome to ensure funds were spent as intended and that learnings are shared. Last year Permafund provided grants of $6,500 to 10 worthwhile projects around the world. This year I contributed $585 to the fund. This represents 10% of the net proceeds from the sale of the calendar, revenue less expenses, but not including any income to myself. The other 90% of profit has been used to further develop the Permaculture Principles website, which has just been rebuilt. The income also supports my family in our own suburban permaculture demonstration project, Abdallah House, in Seymour Victoria. The property is open to the public on International Permaculture Day each year or by appointment. See the blog for more details. With the encouragement that I have received from the permaculture community I have decided to increase this contribution further by tithing income from the whole website to Permafund. As a permaculture consumer it’s important that we make wise choices in the products that we buy. If we choose items that don’t support our values then we are negatively impacting the earth and ultimately ourselves. When we choose to purchase something that fits in with our values, we can help become part of the solution, not the problem. The decisions that we make as small business owners, employees or consumers have impacts throughout the chain of life. 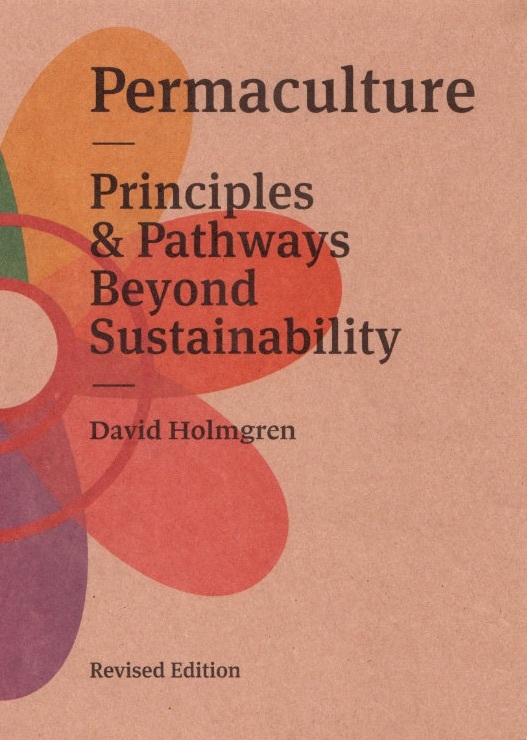 Consider the permaculture ethics whenever you need to make a decision, until they become second nature. May the permaculture ethics embrace all aspects of your life!